Larvae on young shoots in the leaf axils. They are hidden under a copious amount of shining-white wax-wool. Older larvae are marked with black. Univoltine; hibernation as egg. Alnus glutinosa, hirsuta, incana, japonica, viridis. ovipostion inside a bud. 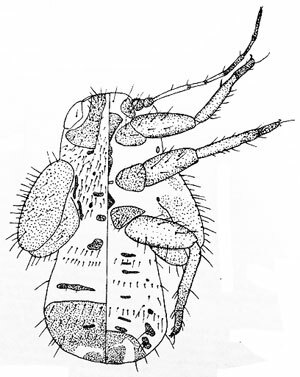 This requires perforation of the bud scales, resulting in a small necrotic spot (Lauterer, 1976a). Abras, Fassotte, Chandelier & Cavelier (2008a), Baugnée, Burckhardt & Fassotte (2002a), Buhr (1964b), Burckhardt (1983a, 2002a), Conci, Rapisarda & Tamanini (1992a), Hellrigl (2004a), Hodkinson (1989a), Hodkinson & White (1979a), Jerinić-Prodanović (2010a), Lauterer (1976a), Lauterer & Dorow (2010a), Malenkovský & Lauterer (2012a), O’Connor & Malumphy (2011a), Ossiannilsson (1992a), Ouvrard, Burckhardt & Cocquempot (2015a), Seljak (2006a), Serbina, Burckhardt & Borodin (2015a), White & Hodkinson (1982a).